With Ahmadinejad now selecting his cabinet, some fear this summer's protests in Iran were a failure. But according to an anonymous Iranian journalist writing in The New Yorker, they've had a big effect on the country's women. "Neda Is My Daughter, I Have One Just Like Her"
They ran past, but not without hitting me as they did — every single one of them, on my legs, on my back, everywhere. One stopped and hit me in the face and shouted at me, and he was a young man, and I remember thinking, This young man is hitting and insulting a woman he doesn't know, who is old enough to be his mother! He must be crazy or something! It appealed to Shahrzad that the woman in question had mischievously exploited the maternal role that society allotted her in order to save young men from a beating. Inside this movement of oppressed freedom-seekers, Shahrzad seemed to be saying, there was a second, less obtrusive movement, of women playing with their status. Shahrzad tells the author another story, about being insulted by a female Ahmadinejad supporter who happened to be wearing a body-hugging coat and makeup. Shahrzad asked her, "Why are you wearing so much eyeliner? Weren't you ever told you should only wear makeup for your husband?" The crowd then turned against the woman, mocking her style of dress until she was forced into "slinking away." It's a surprising tactic for a woman who is angry about the Islamic Republic's discrimination against women — and Negin points out that many women who initially supported the 1979 revolution were distressed by the new Republic's modesty laws and makeup prohibitions. Shahrzad says her son "doesn't like that I humiliated this woman using arguments I don't believe in," but she smiles as she tells her story. 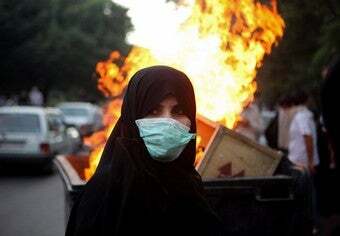 She and other Iranian women clearly find themselves uniquely placed to use deception and social pressure, tactics sometimes more effective than the beatings of the Basiji. That said, the real story of women's involvement in the 2009 protests may be one of equality, not exceptionalism. The author writes, "For the first time in Iran's history, men and women in large numbers marched as equals. When, at Friday prayers on July 17th, thousands of men and women scandalized traditionalists by praying side by side, in the streets around Tehran University, Iran's culture of separation gave way to one of solidarity." Ahmadinejad and the Islamic Republic have not been toppled this time around. But, says the author, "the middle tier of Iranian society has become urgently politicized — activists whose goal, an end to tyranny, is now clear. Half of that tier is women." For a generation of well-educated women whose "social and professional avenues [...] are often disappointingly narrow," this may mean an opportunity for a new and more public life. For the government of Iran, it may mean a choice between liberalization (Iran's "gender laws are among the harshest in the world") or facing the wrath of half its population, oppressed for thirty years and now beginning to flex its power.